A studio with style, flair and location at Surfer's Beach. A studio apartment loaded with style and modern appliances for an unbelievable price. A fifteen minute walk to the famous Surfer's beach brings you to absolute Beach Bliss. You just can't go wrong with our little bit of paradise. This gem is located on the bottom floor of Cloudbreak Bahamas. 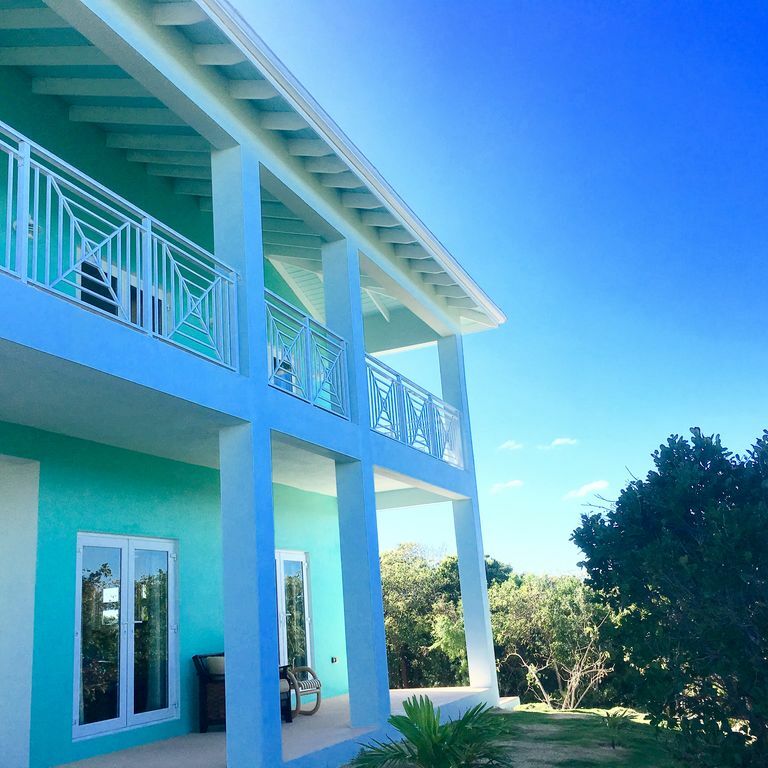 (We also have available Cloudbreak Bahamas Upstairs VRBO 1203847 or Cloudbreak Whole House VRBO 643041) The huge front porch makes you just want to stay, relax and listen to the birds. (You will be tempted but don't give in. There is so much more to do and see!) It has a full well equipped kitchen w/ full size washer and dryer. Three sets of french doors looking out to the garden and front porch keeps everything sunny and bright. We have used bright colors combined with some retro style. With the queen bed and queen futon in the open floor plan, it can handle a family of four with plenty of room to spread out. We have a flat screen TV and DVD with plenty of movies, books and games. Don't forget about the two person kayak . We have life jackets, paddles and tie downs for your rental car. Eleuthera is the place for adventure on and off the water. Our motto is: Unplug, Explore, Get Wet, Relax, Repeat. We are located on the highest point, on top of the hill, directly above Surfer's beach. We have the breeze and no bugs. The tropical trails that lead you to the beach are a fifteen minute walk. The neighborhood is quiet and peaceful. The trails have excellent examples of the tropical plants found on Eleuthera, our little garden of Eden. The nearest town is three miles away. This is Gregory Town. You will be able to find your basic groceries, fuel, ice and local restaurants. You might be tempted to stay put and just enjoy Gregory Town and the Surfer's beach area. An excellent choice but Eleuthera is 110 miles long. There is so much to see and do: Queen's Bath, gobs of beautiful beaches, caves with bats, reefs right off shore. We can't wait to see what adventures you will find. Connecting cities from the USA are Atlanta, Miami, Ft. Lauderdale and sometimes Orlando. We are both retired recently from our local fire departments. We have always loved travel. We always come back to the Bahamas and always will. It is special. We have cut our teeth on travel going back and forth to the Bahamas. We love Gregory Town, the people and the place. Surfer's Beach is beautiful and caught in time. The land time forgot is just where it is. When you are our guests you will have the view of Heaven and the ocean. You will have a gorgeous breeze that will cool and refresh your soul. Our home is relaxing and you will not want to leave. However, the island will call you and you will want to explore and we have a great location to do it from. Enjoy! We are a 15 min. walk to the famous Surfer's Beach. The nature trails lead to the beach and along the ocean cliffs on the Atlantic and Exuma Sound. Eleuthera Island Shores is a park like neighborhood. It is made up of hiking trails that lead to Surfer's Beach. It is sparsely populated and extremely private. salt, pepper, basic spices, flour, oil, sugar, foil, garbage bags, dish soap, dishwasher soap, laundry soap, hand soap, sponges, 2 rolls of paper towels, 4 rolls of toilet paper. Full set of dishes, service for six, glasses, all kichen utensils. We do not have internet on purpose, put that square box down. Unplug, get wet, relax, repeat. Our studio is located south of Gregory Town and north of the Rainbow Bay area. We have a great location to explore the entire island. With in a 3 min. drive are the Bat Caves. Just north of the North Eleuthera airport you will find the Sapphire Blue Hole, Preachers Cave, the ferry to Spanish Wells and the ferry to Harbour Island. There are several white sand beaches with calm, crystal blue water between the North Eleuthera Airport and Gregory Town. The Glass Window Bridge is also a terrific spot for pictures and a beer. Near the bridge is the Queen's bath and the Cow and Bull formations. These are just a few of the terrific locations for you to explore. There is much, much more.